Updates to J.D. 's profile since your last visit are highlighted in yellow. Worked for Moore Business Communications for 20 yrs. Supervisor at Ingram Book for 5 years. Supervisor at FedEx Freight for 3 years. Classmates know me as J.D. Remember the class trip to Disney, what a great time! J.D. Monn has a birthday today. J.D. Monn updated profile. View. 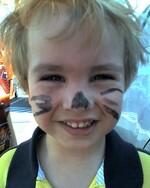 Brandon at the YMCA fun day. Daddy's girl with her puppy.